Children need to know how to be social before they can dance together. Socialization comes from positive interaction in a nurturing environment with other children. Socialization occurs in several ways. Students touching each other is a major obstacle. Dance skills can be enhanced when students do not recognize that they are working on dance skills. 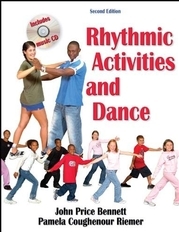 The activities in this book will motivate students to work on dance skills without any risk of embarrassment. Based on standards from the National Dance Association, the National Association for Sport and Physical Education, and the North Carolina Standard Course of Study, this book is even more user friendly than its previous edition. The organization moves from easy rhythmic games and activities to specific dances, including line dances, folk dances, mixers, square dances, and social dances. You can select activities across chapters or develop units of instruction per chapter, depending on the interest levels and abilities of your students. The book also contains cross-references to companion music provided on the CD. Having this CD means you will have music for many of the dances and lessons without expending extra funds, time, and effort to find appropriate music. Rhythmic Activities and Dance, Second Edition, is an essential resource for teachers, recreation directors, and recreation leaders looking to include all students and to encourage fit, joyful lifelong movers and learners. With its built-in progression, its wide array of selections, and its flexibility in shaping a dance program, you will not be out of step with this new edition. Reference for K-12 teachers, recreation directors, and recreation leaders. Textbook for physical education, recreation, and kinesiology pedagogy majors taking teaching methods courses. John Price Bennett, EdD, has been teaching dance to people of all ages, from preschool to older adults, since 1969. He is a professor in the health and applied human sciences department at the University of North Carolina at Wilmington, where he has taught dance since 1992. His primary teaching areas in dance are pre-K-12 children's creative dance, folk, square, ballroom, and Latin dance. His major focus in his teaching and research is on the preservation of our intangible cultural heritage through the medium of dance and bringing people together through dance. John has written more than 100 publications and given more than 350 presentations throughout his career, and he stays in high demand to teach dance and provide staff development across the United States and abroad. He has been bestowed with many honors, including the American Alliance for Health, Physical Education, Recreation and Dance (AAHPERD) Honor Award for 2004 for meritorious service. He has served in many capacities on AAHPERD committees and is a member of the National Association for Sport and Physical Education and the National Dance Association (NDA). He has received numerous state and national teaching awards. Pamela Coughenour Riemer, MA, has been teaching physical education since 1969 and has had recreational dance as a major component of her curriculum. Currently she is a teacher in the Scotland County School System in Laurinburg, North Carolina. Her teaching integrates the North Carolina Standard Course of Study across the entire curriculum. Her physical education program was a North Carolina President's Council on Physical Fitness Demonstration Center for 14 years. Pamela was named North Carolina Secondary Physical Education Teacher of the Year in 1990-1991. She was the creator and choreographer for the Sycamore Lane Dance Company that has performed at 10 state AAHPERD conventions and 3 national AAHPERD conventions along with more than 200 presentations and staff developments on a state, national, and international level. She was one of the authors for the current North Carolina Standard Course of Study dance component. Pamela has served on the board of directors for the North Carolina Dance Association and is a member of AAHPERD, the NDA, and the North Carolina Dance Association. She was hired as a consultant for the U.S. Department of Defense to teach and demonstrate her techniques for teaching recreational dance in Wiesbaden, Germany.